Well, SFYTT IS BACK!! YAY!! I enjoyed the break, but really missed using a new sketch each week. It really gets your mojo going (and keeps it going, I think)! If ya'll are new to my blog, every Saturday, Jen puts out a little challenge called "A Sketch For You To Try". Just a sketch, no sketch police. Me and 4 other rockstar stampers contribute samples on our blogs to help inspire you. Starting now, every month Jen will be picking a Guest Designer for the next month from the "participant pool". So--play in the sketches this month, and YOU could be the Guest Designer for March! More good news--Since we are kicking off SFYTT with a BANG this year, there's a PRIZE PACKAGE worth over $200 up for grabs! Lots of stuff from the companies listed in the little graphic. You won't believe all the loot that has been donated for this! Let me share a little about my card today before we get to the rules on how to win. I'm a rules girl don't you know, but first things first, ok? It's a super sneaky peek of the new set coming from The Cat's Pajamas on February 9th. It's called Bear Thing. (have you sent in YOUR entry to name the bear? Read about it HERE.) It's an all occasion set that covers a multitude of holidays. I've jumped ahead a little here and have made an Easter card based on the sketch. I pulled some colors from some of my favorite Girl Friday papers from Cosmo Cricket. Notice the sketch was the same one I used in THIS post? I snuck one over on you, huh!? Two drastically different looks, eh? The sketch looks hard, but it's really not. You can do anything you want with it! I can't wait to see your projects! 1. A new sketch will be posted at www.iheart2stamp.com each Saturday in February. 2. There will be a Slide Guest Book that you can post your creation(s) to at the END of each of those posts. 3. You will have until March 2nd to post your creations to the corresponding sketch. Be sure that each of your creations is posted to the correct Slide Guest Book. 4. You can enter as many times as you like, but must upload each creation seperately. All entries should be posted to your blog or online gallery, as well. Please use the keyword "SFYTT" for all online galleries. 5. All participants will also be considered for next month's Designer of the Month. 6. 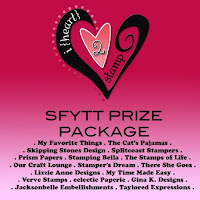 A RANDOM participant will win the prize package and will be announced on March 3rd at www.iheart2stamp.com (Jen's blog). Winner will have five days to contact Jen via email to claim prize. 7. The March Designer of the Month will be chosen and contacted March 3rd, but will not be announced until the first Saturday of March over on Jen's blog..
Next, ya'll may need some more inspiration with this week's sketch. These are my SFYTT sisters. They want you to come for a visit or get re-acquainted! SUSIE Q-TIP: Attach a handmade "Ribbon-Button-Loopy Thing Embellishmet" to a different colored piece of ribbon. In other words, use one kind for the main piece and another for the embellishment. Oh, just look at the picture. You can find my tutorial on how to make them HERE. I don't know what to say, Sus--this is just perfect in every way! You have done Alma proud!! Love that paper and mr. bear is just as cute as can be with that yummy basket! Love all the extras! Good to be back, isn't it?! I missed you girls! Beyond adorable!!! Love those paper and color combos! This just pops! 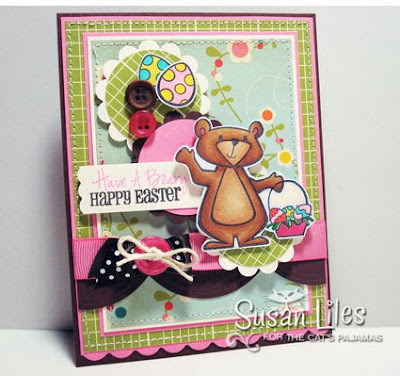 Susan, this is such a bright & cheerful card! I love all the "happy" colors! Said it before...I'll repeat...your attention to amazing detail will always bowl be over. It's a visual fireworks display of fun papercrafting and stamping yumminess! This is so cute and I Love all of the fun details! Your coloring is amazing! I have been meaning to email you...Rhett is my BIL's name! When you left that comment on my blog about it being a great name and a good football player's name, I had to laugh, since he was a football player, etc. LOL! Great job on the sketch!